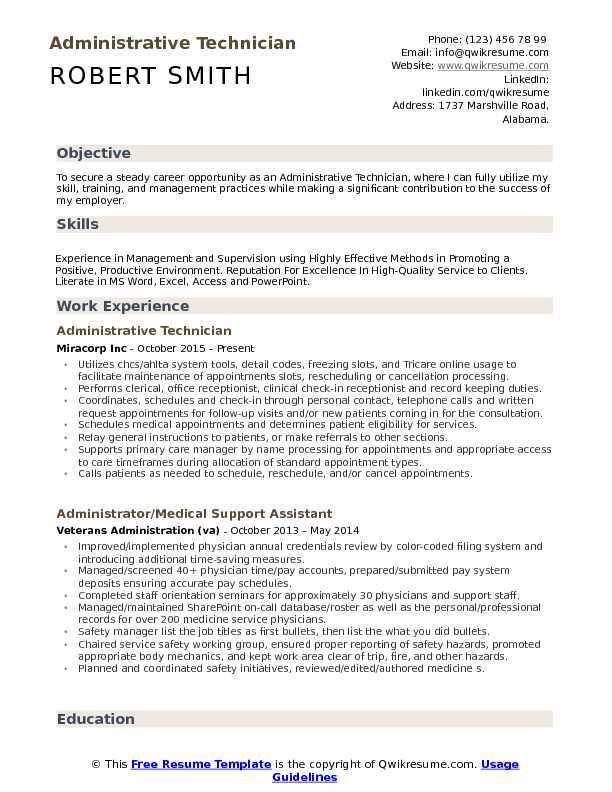 An Administrative Technician is responsible for providing administrative and clerical support to the organization. 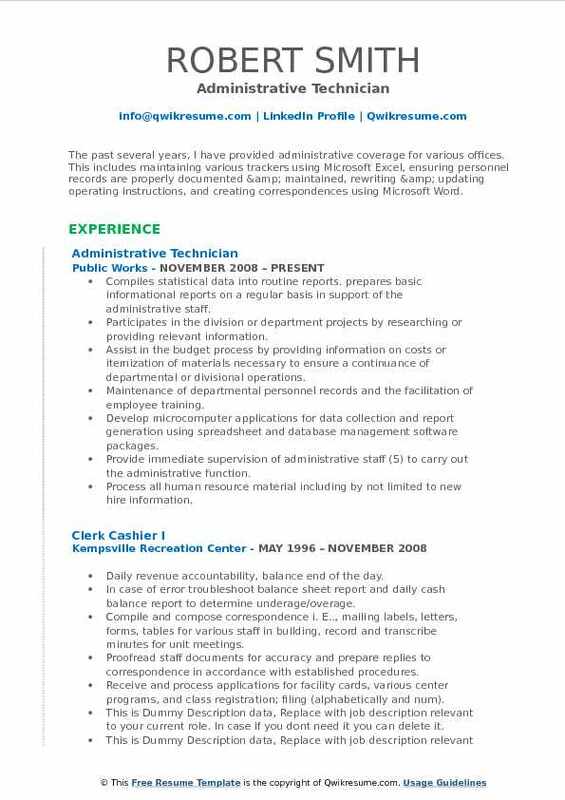 The roles and responsibilities underlined in the job description template are greeting visitors, resolving information request, supervising and supporting the clerical staff. The individual also has to review, track and prepare budgets, manage records and database and manage office supplies. 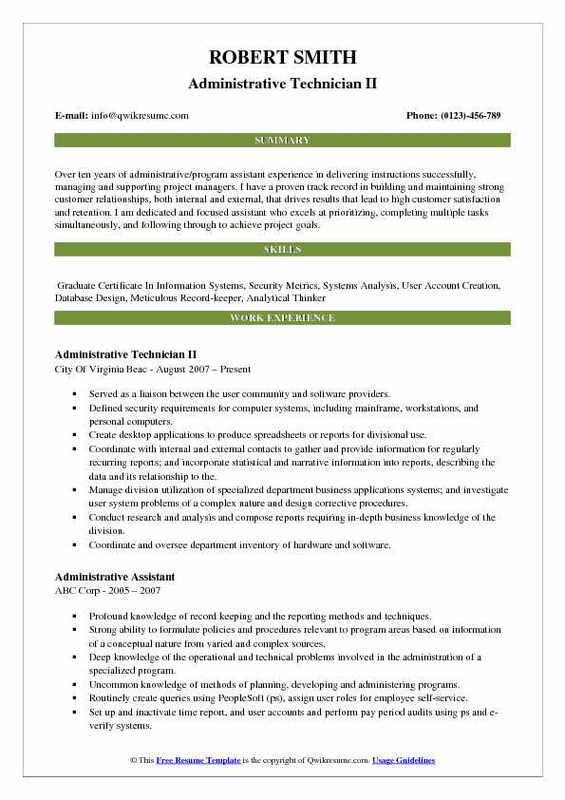 The duties highlighted in the Administrative Technician Resume are coordinating departmental functions, managing all official software and providing excellent customer support. There are also responsibilities like coordinating the different departmental operations and managing the space and other office events. The skills required are excellent written and verbal communication skills, proficiency in Microsoft Office, good organizational and time management skills. The educational qualification required is a high school diploma or equivalent. Experience in related field is an added advantage. Objective : Quick-learning and dedicated Administrative Technician (AT) with a solid history of customer service proficiency and strong time management skills. Self-motivated to provide ample assistance to students, school-level personnel, and supervisory staff and troubleshoots solutions to complex issues. Strengths include handling tasks with accuracy and efficiency, knowledge of information and policies, and building effective customer-service relationships. Serves as a desktop operating systems expert to analyze requirements, plan systems architecture, ensure desktop quality, document deficiencies, train Users, and install, configure, and maintain desktop operating systems. Receives new hardware for setup and performs necessary upgrades for the desktop. Operating systems and infrastructure from DoDEA IT regional office to install and integrate system fixes, enhancements, and updates. Coordinates with system administrators to ensure that server-based resources. Are available as needed to support workstation operating systems as well as monitor, analyze, and troubleshoot active directory problems, messaging. Analyzes desktop operating systems information assurance requirements to ensure confidentiality, integrity, and availability of software utilizing set rules,. Utilizes thorough knowledge of the interdependence of workstation-based software, the workstation operating system, and web-based servers to analyze, Document and plan for additions, upgrades, or configuration of the application. Uses software delivery servers to install, configure and maintain workstation. Software and workstation web services in response to customer requests. Headline : Ethical, courteous, and knowledgeable professional who offers versatility to work independently or with a team, and who quickly adapts to changing environments with proven capability to learn, apply new knowledge, and ultimately achieve professional and personal goals. 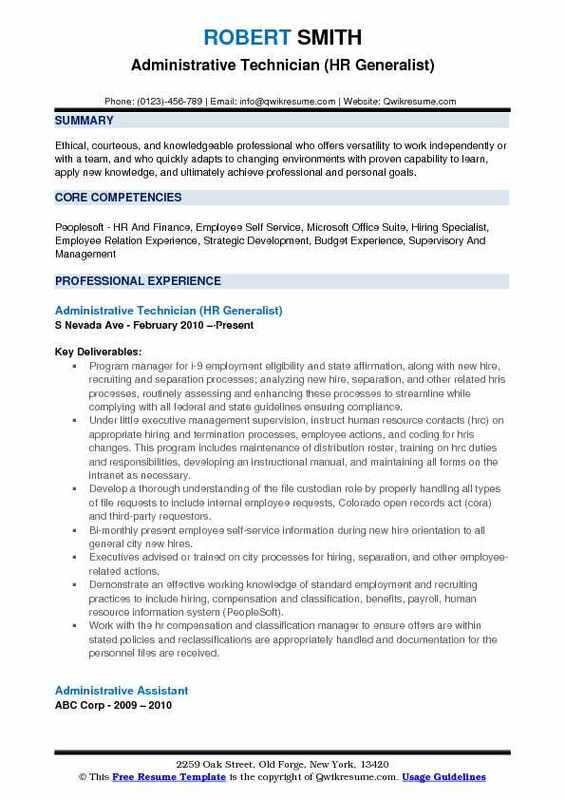 Program manager for i-9 employment eligibility and state affirmation, along with new hire, recruiting and separation processes; analyzing new hire, separation, and other related hris processes, routinely assessing and enhancing these processes to streamline while complying with all federal and state guidelines ensuring compliance. Under little executive management supervision, instruct human resource contacts (hrc) on appropriate hiring and termination processes, employee actions, and coding for hris changes. This program includes maintenance of distribution roster, training on hrc duties and responsibilities, developing an instructional manual, and maintaining all forms on the intranet as necessary. Develop a thorough understanding of the file custodian role by properly handling all types of file requests to include internal employee requests, Colorado open records act (cora) and third-party requestors. Bi-monthly present employee self-service information during new hire orientation to all general city new hires. Executives advised or trained on city processes for hiring, separation, and other employee-related actions. Demonstrate an effective working knowledge of standard employment and recruiting practices to include hiring, compensation and classification, benefits, payroll, human resource information system (PeopleSoft). Work with the hr compensation and classification manager to ensure offers are within stated policies and reclassifications are appropriately handled and documentation for the personnel files are received. Work with HR managers and information systems to implement new compensation guidelines based on consultants study which requires revamping current salary structure. Assist with various projects to include compensation study, performance management system changes, and on-boarding process changes. Summary : Over ten years of administrative/program assistant experience in delivering instructions successfully, managing and supporting project managers. I have a proven track record in building and maintaining strong customer relationships, both internal and external, that drives results that lead to high customer satisfaction and retention. I am dedicated and focused assistant who excels at prioritizing, completing multiple tasks simultaneously, and following through to achieve project goals. Served as a liaison between the user community and software providers. Defined security requirements for computer systems, including mainframe, workstations, and personal computers. Create desktop applications to produce spreadsheets or reports for divisional use. Coordinate with internal and external contacts to gather and provide information for regularly recurring reports; and incorporate statistical and narrative information into reports, describing the data and its relationship to the. Manage division utilization of specialized department business applications systems; and investigate user system problems of a complex nature and design corrective procedures. Conduct research and analysis and compose reports requiring in-depth business knowledge of the division. Coordinate and oversee department inventory of hardware and software. Remarkable ability to plan, direct, and coordinate program and administrative activities of a complex, interrelated, and interdependent nature, where unknowns and numerous contingency factors are involved. Summary : The past several years, I have provided administrative coverage for various offices. This includes maintaining various trackers using Microsoft Excel, ensuring personnel records are properly documented & maintained, rewriting & updating operating instructions, and creating correspondences using Microsoft Word. Compiles statistical data into routine reports. prepares basic informational reports on a regular basis in support of the administrative staff. Participates in the division or department projects by researching or providing relevant information. Assist in the budget process by providing information on costs or itemization of materials necessary to ensure a continuance of departmental or divisional operations. Maintenance of departmental personnel records and the facilitation of employee training. Develop microcomputer applications for data collection and report generation using spreadsheet and database management software packages. Provide immediate supervision of administrative staff (5) to carry out the administrative function. 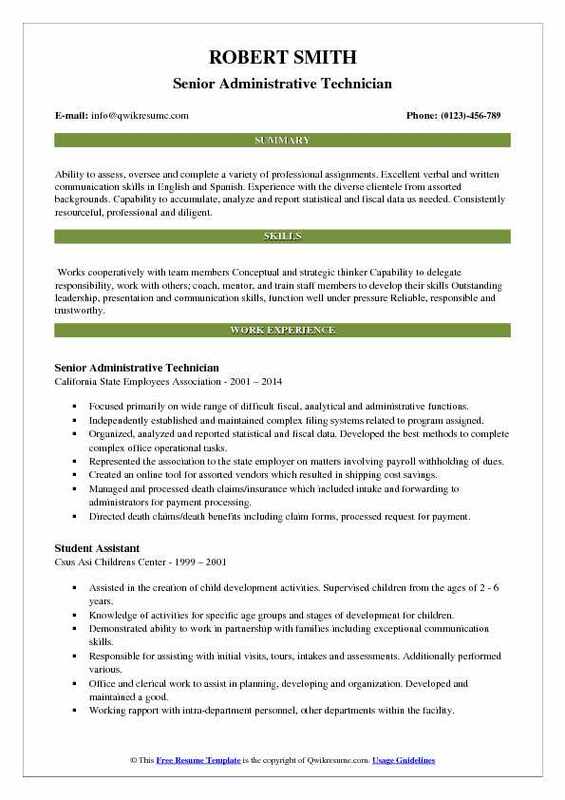 Process all human resource material including by not limited to new hire information. Payroll and leave entry into insite - oracle (payroll/leave database). Handle pertinent correspondence and various other information for the city engineer and other executives alike. Proofread staff documents for accuracy and prepare replies to correspondence in accordance with established procedures, record and transcribe minutes for unit meetings. 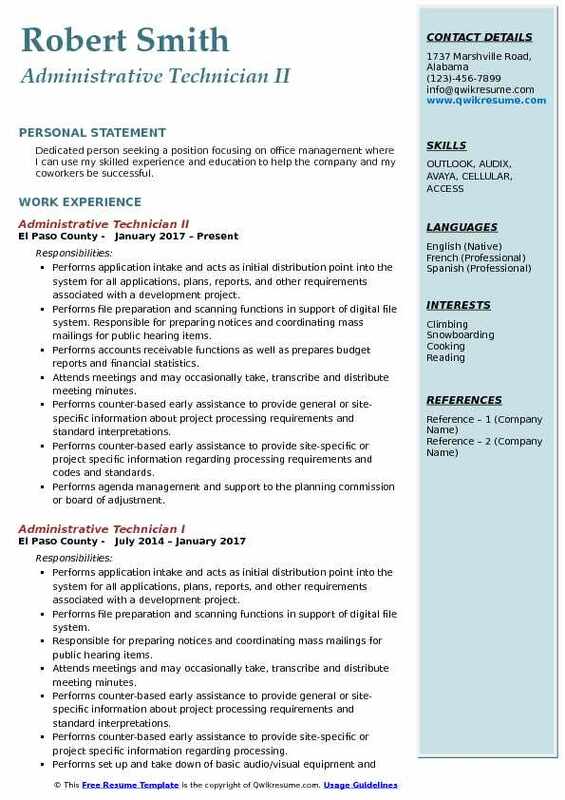 Headline : Dedicated person seeking a position focusing on office management where I can use my skilled experience and education to help the company and my coworkers be successful. Performs application intake and acts as initial distribution point into the system for all applications, plans, reports, and other requirements associated with a development project. Performs file preparation and scanning functions in support of digital file system. Responsible for preparing notices and coordinating mass mailings for public hearing items. Performs accounts receivable functions as well as prepares budget reports and financial statistics. Attends meetings and may occasionally take, transcribe and distribute meeting minutes. Performs counter-based early assistance to provide general or site-specific information about project processing requirements and standard interpretations. Performs counter-based early assistance to provide site-specific or project specific information regarding processing requirements and codes and standards. Performs agenda management and support to the planning commission or board of adjustment. Operates as entry point staff providing routing for customer service. Acts as initial point of contact to determine specific customer needs. Performs data entry and inputs information into database regarding projects. 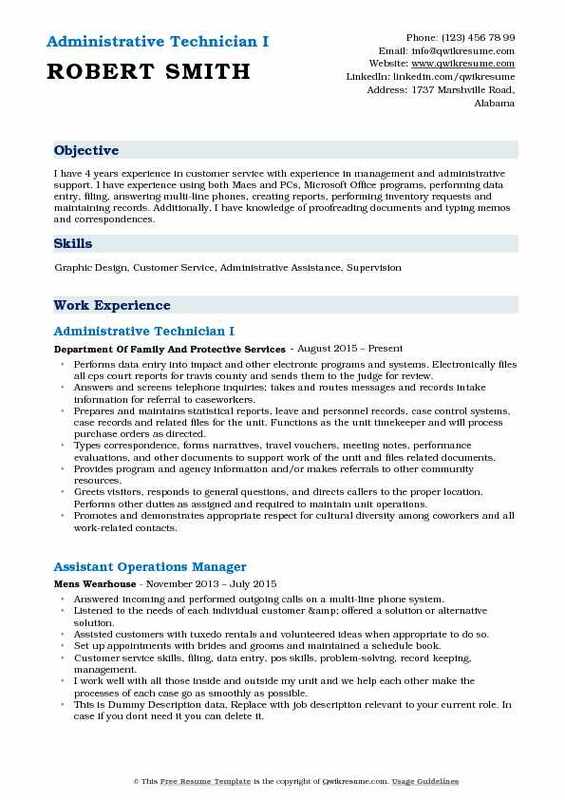 Objective : I have 4 years experience in customer service with experience in management and administrative support. I have experience using both Macs and PCs, Microsoft Office programs, performing data entry, filing, answering multi-line phones, creating reports, performing inventory requests and maintaining records. Additionally, I have knowledge of proofreading documents and typing memos and correspondences. Performs data entry into impact and other electronic programs and systems. Electronically files all cps court reports for travis county and sends them to the judge for review. Answers and screens telephone inquiries; takes and routes messages and records intake information for referral to caseworkers. Prepares and maintains statistical reports, leave and personnel records, case control systems, case records and related files for the unit. Functions as the unit timekeeper and will process purchase orders as directed. Types correspondence, forms narratives, travel vouchers, meeting notes, performance evaluations, and other documents to support work of the unit and files related documents. Provides program and agency information and/or makes referrals to other community resources. Greets visitors, responds to general questions, and directs callers to the proper location. Performs other duties as assigned and required to maintain unit operations. Promotes and demonstrates appropriate respect for cultural diversity among coworkers and all work-related contacts. Ability to effectively handle multiple assignments in a dynamic environment. 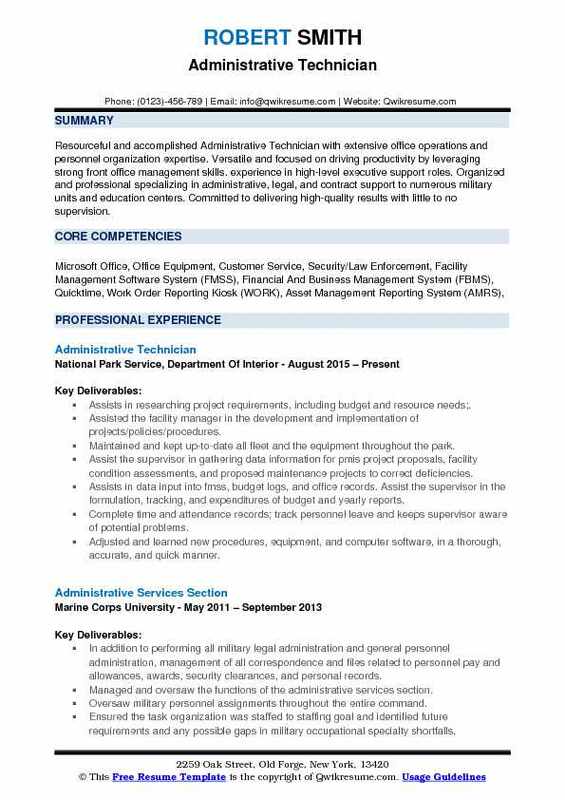 Summary : A goal oriented and accomplished Administrative Support professional with 10 years of extensive experience. Diverse background in geriatric care. Strong communication and interpersonal skills are a result of working with the public, as well as within various diverse departments, and levels of supervisors. Provide technical and administrative support to the customer service center, which is part of the economic independence division (eid) within dhs. Work in close partnership with all programs administered by eid division (housing grant, section 8 housing choice voucher program, employment services, snap, tanf, medicare and medicaid). Utilize my bi-lingual ability to interpret, interact and complete forms for client. Screen and route high volume phone calls and customers to appropriate staff members. Routinely serve as departmental front desk coverage at the customer service center. Research, screen, provide information and refer clients to different programs (housing, employment, snap, tanf, child and family services, adult and disabled services, and medicare and medicaid) within dhs. Enter and verify time sensitive and confidential information on benefits (snap, tanf, medicare, medicaid, general relieve, and the affordable health care) in the data base (spider, vacms, adapt, visual homes and the state medicaid software) for public assistance, housing grant and the department of housing and urban development housing choice voucher program. Notarize documents and maintain confidential information on customers in the data base (spider, vacms, adapt, visual homes and virginia medicaid software). 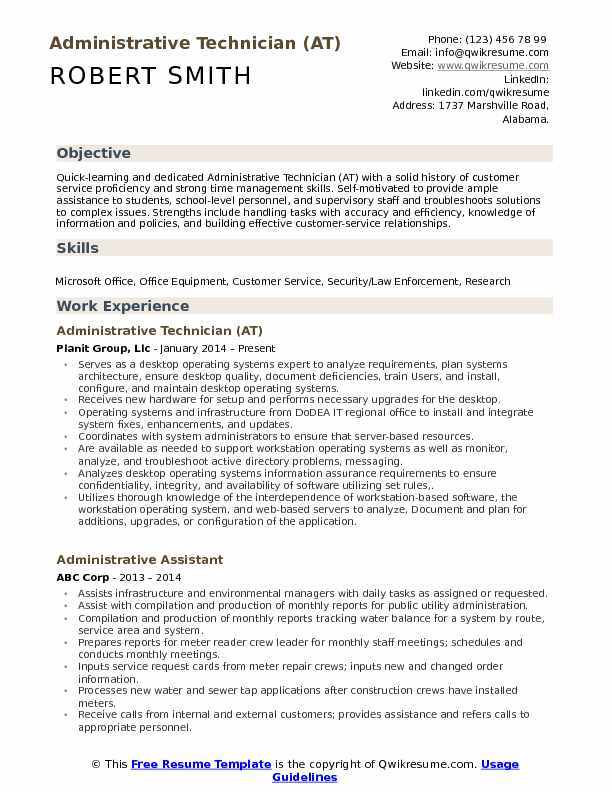 Provide general administrative support to the customer service manager (file, fax, copy, and translate) within dhs and the customer service center. Summary : Successfully manage multiple projects simultaneously, utilizing time and priority management skills to reach targeted deadlines and goals; the ability to establish and maintain solid business relationships with professionals, vendors, and co-workers to generate business; disseminate information to clients and constituents via written communications and public speaking engagements. Managed payroll, benefits, workers compensation, and assist with processing new hires. Compiled and supplied data for monthly reports that captures the work of the division of storm water management. Responded to citizens inquiries and requests, answered and directed phone calls to appropriate personnel. Supervised and monitored a team that enters data into the hansen work management system (crm), and trained administrative staff and supervisors on using hansen; to include updates, running reports, entering data. Processed payroll data into peoplesoft database, leave absence, overtime, and on-call pay. Facilitated benefits training for new employees and organize open enrollment benefits training. Maintained and updated personnel records and prepare worker compensation claims. Communicated with the human resource department regarding various issues on employee benefits, disability, and retirement. Received employee of the quarter 2011 & 2014, employee of the year 2011, and 2011 nominee for the 35th annual ebby awards. 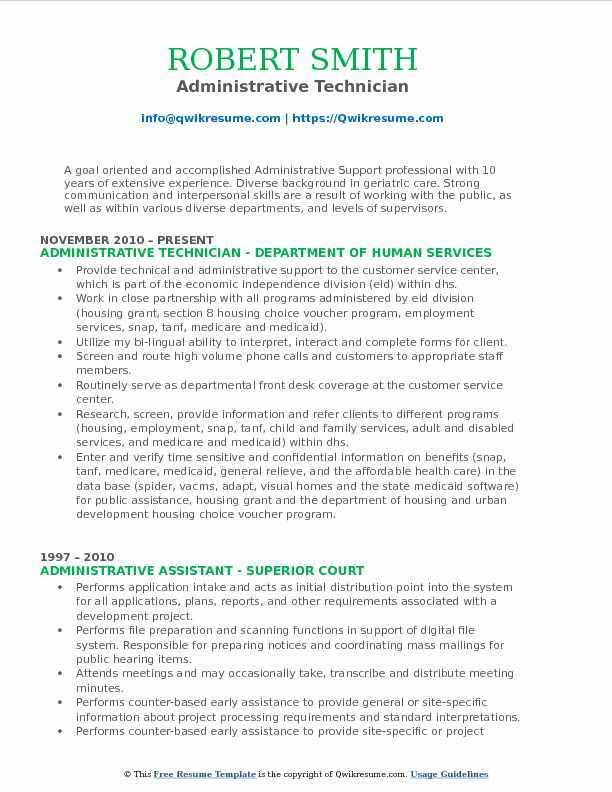 Summary : Administrative Technician who goes above and beyond basic administrative tasks and takes on multiple projects at once. Excellent work ethic and strength in boosting company morale while being a team player and growing my career. Answered and managed multiple incoming and outgoing calls in the phone center while recording accurate messages. Opened and properly distributed incoming mail as well as processing mail quickly and concisely. Subject matter expert in the apportion registration and excellent customer service. Communicated with both internal and external customers, county partners, law enforcement, state officials and other government entities. Daily handling and reconciliation of large amounts of cash and checks. Trained other staff members and act in the capacity of the subject matter expert on topics related to the vehicle titles and registration. Drafted a monthly time sheet to be completed and turned in at the end of each month. 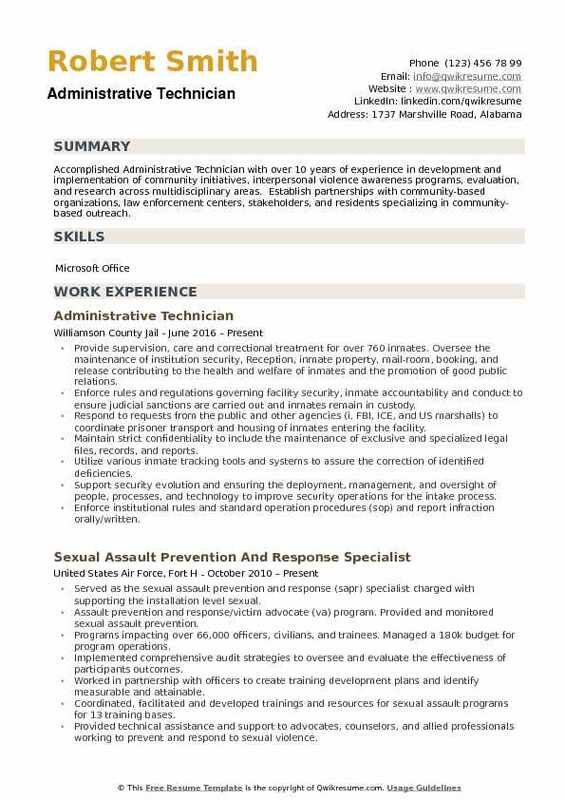 Summary : Accomplished Administrative Technician with over 10 years of experience in development and implementation of community initiatives, interpersonal violence awareness programs, evaluation, and research across multidisciplinary areas. Establish partnerships with community-based organizations, law enforcement centers, stakeholders, and residents specializing in community-based outreach. Provide supervision, care and correctional treatment for over 760 inmates. Oversee the maintenance of institution security, Reception, inmate property, mail-room, booking, and release contributing to the health and welfare of inmates and the promotion of good public relations. Enforce rules and regulations governing facility security, inmate accountability and conduct to ensure judicial sanctions are carried out and inmates remain in custody. Respond to requests from the public and other agencies (i. FBI, ICE, and US marshalls) to coordinate prisoner transport and housing of inmates entering the facility. Maintain strict confidentiality to include the maintenance of exclusive and specialized legal files, records, and reports. Utilize various inmate tracking tools and systems to assure the correction of identified deficiencies. Support security evolution and ensuring the deployment, management, and oversight of people, processes, and technology to improve security operations for the intake process. Enforce institutional rules and standard operation procedures (sop) and report infraction orally/written. Explain rules and procedures of the facility to (individual/group) prisoners to identify the expectations and consequences of their behavior. 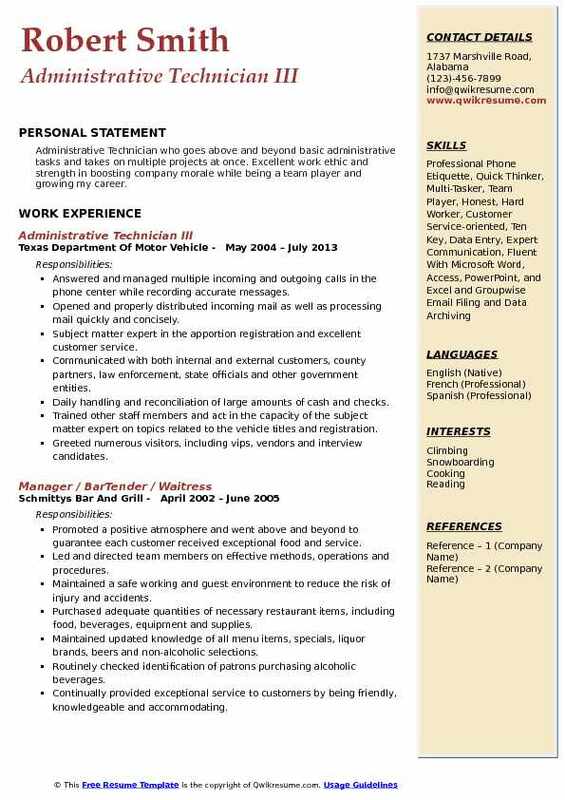 Objective : To secure a steady career opportunity as an Administrative Technician, where I can fully utilize my skill, training, and management practices while making a significant contribution to the success of my employer. Skills : Experience in Management and Supervision using Highly Effective Methods in Promoting a Positive, Productive Environment. Reputation For Excellence In High-Quality Service to Clients. Literate in MS Word, Excel, Access and PowerPoint. Utilizes chcs/ahlta system tools, detail codes, freezing slots, and Tricare online usage to facilitate maintenance of appointments slots, rescheduling or cancellation processing. Performs clerical, office receptionist, clinical check-in receptionist and record keeping duties. Coordinates, schedules and check-in through personal contact, telephone calls and written request appointments for follow-up visits and/or new patients coming in for the consultation. Schedules medical appointments and determines patient eligibility for services. Relay general instructions to patients, or make referrals to other sections. Supports primary care manager by name processing for appointments and appropriate access to care timeframes during allocation of standard appointment types. Calls patients as needed to schedule, reschedule, and/or cancel appointments. Promotes consult/referral specialty medical care within the military treatment facility. 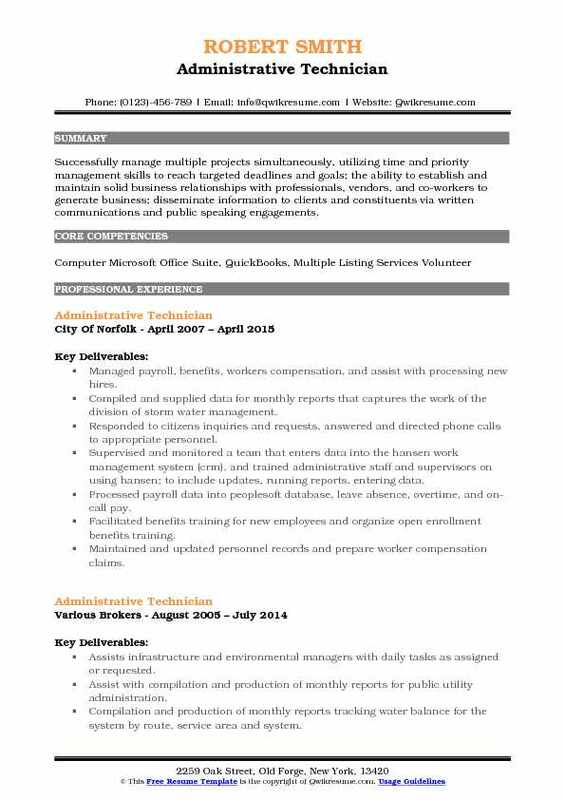 Summary : Resourceful and accomplished Administrative Technician with extensive office operations and personnel organization expertise. Versatile and focused on driving productivity by leveraging strong front office management skills. experience in high-level executive support roles. Organized and professional specializing in administrative, legal, and contract support to numerous military units and education centers. Committed to delivering high-quality results with little to no supervision. Assists in researching project requirements, including budget and resource needs;. Assisted the facility manager in the development and implementation of projects/policies/procedures. Maintained and kept up-to-date all fleet and the equipment throughout the park. Assist the supervisor in gathering data information for pmis project proposals, facility condition assessments, and proposed maintenance projects to correct deficiencies. Assists in data input into fmss, budget logs, and office records. Assist the supervisor in the formulation, tracking, and expenditures of budget and yearly reports. Complete time and attendance records; track personnel leave and keeps supervisor aware of potential problems. Adjusted and learned new procedures, equipment, and computer software, in a thorough, accurate, and quick manner. Maintained positive relations with all park personnel, partners, including, but not limited to contractors, regional office representatives, utility company representatives, and the general public. Summary : Ability to assess, oversee and complete a variety of professional assignments. Excellent verbal and written communication skills in English and Spanish. Experience with the diverse clientele from assorted backgrounds. Capability to accumulate, analyze and report statistical and fiscal data as needed. Consistently resourceful, professional and diligent. Skills : Works cooperatively with team members Conceptual and strategic thinker Capability to delegate responsibility, work with others; coach, mentor, and train staff members to develop their skills Outstanding leadership, presentation and communication skills, function well under pressure Reliable, responsible and trustworthy. Focused primarily on wide range of difficult fiscal, analytical and administrative functions. Independently established and maintained complex filing systems related to program assigned. Organized, analyzed and reported statistical and fiscal data. Developed the best methods to complete complex office operational tasks. Represented the association to the state employer on matters involving payroll withholding of dues. Created an online tool for assorted vendors which resulted in shipping cost savings. Managed and processed death claims/insurance which included intake and forwarding to administrators for payment processing. Directed death claims/death benefits including claim forms, processed request for payment. Directly assisted in the administration of a csea division, in addition to the full range of secretarial. Backup for the appropriate csea manager of delegated non-management tasks.